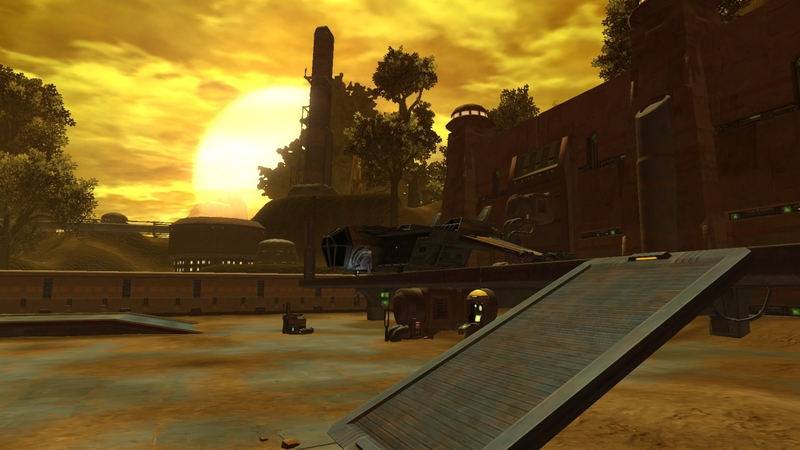 Hutta is the starting planet in Star Wars TOR for both the Bounty Hunter and Imperial Agent. 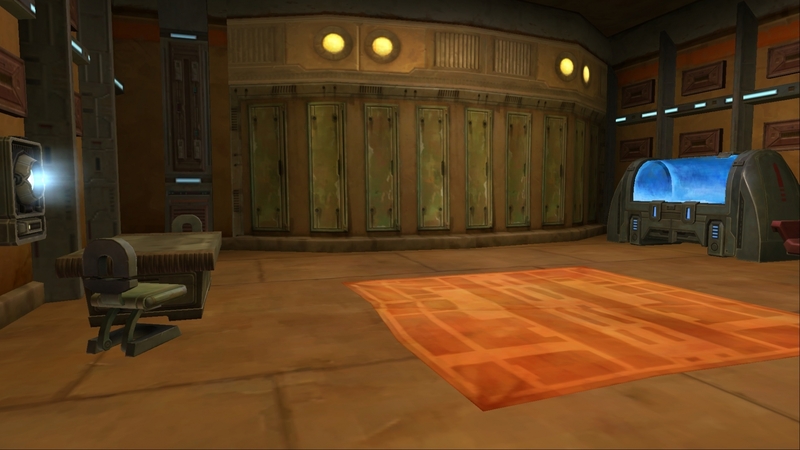 Both of their stories start them off in the west side area of the map in the Poison Pit Cantina. 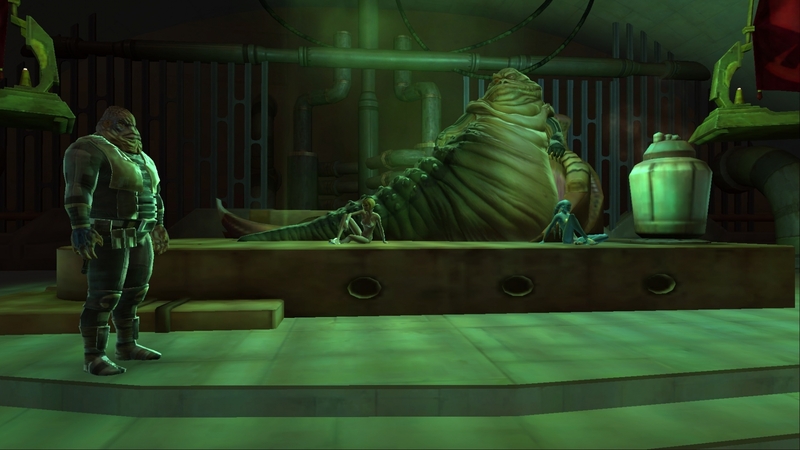 This planet is controlled by the Hutts. 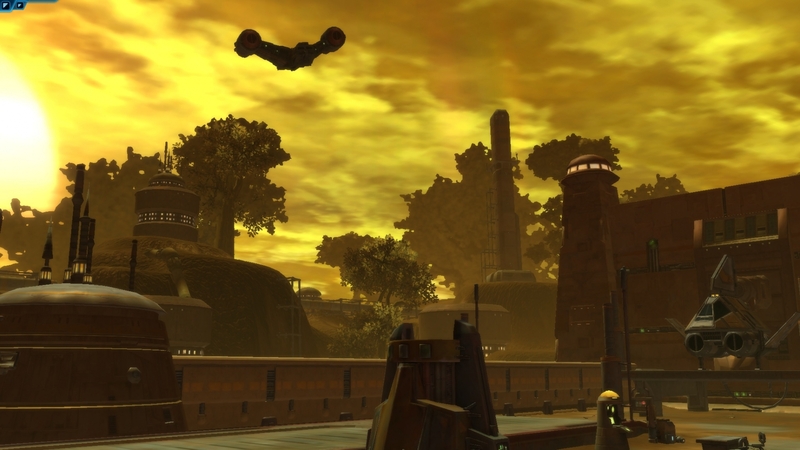 There are two Hutts, Nem’ro and Fa’athra, that are deeply embroiled in the middle of a turf war; a war that you are about to enter yourself. Hutta is for levels 1 through 10. 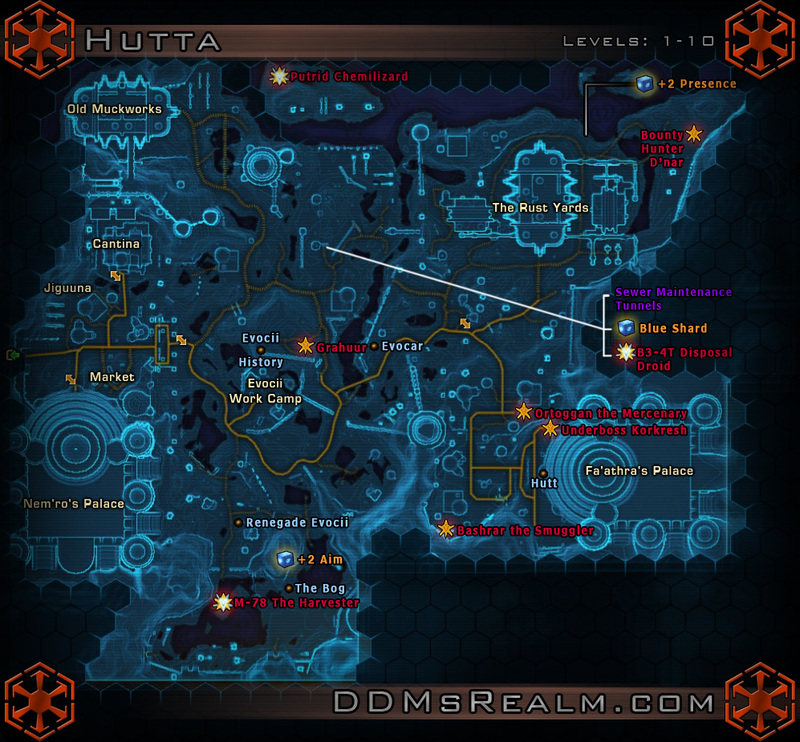 This guide is a quick overview of the area with some spoilers and tips to help you make the most out of your time on Hutta. If you are an explorer and like the thrill of wandering around by yourself and discovering things on your own, DO NOT read this guide until you have finished your exploration. Then come back and see if there is anything you missed or if there is something you cannot find. 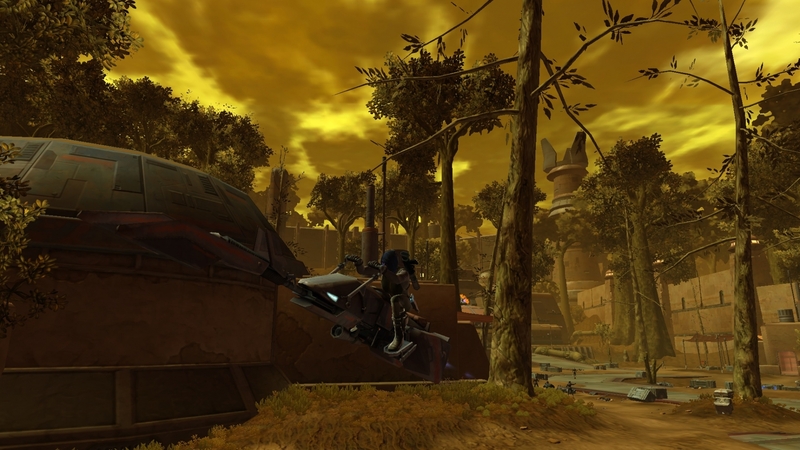 The speeder routes and bind points are a little weird on Hutta. Make sure you use both of these in order to get around efficiently. I found this planet the hardest to get around. Also, keep your guard up here. Enemies lurk everywhere, so don’t think you are safe anywhere. 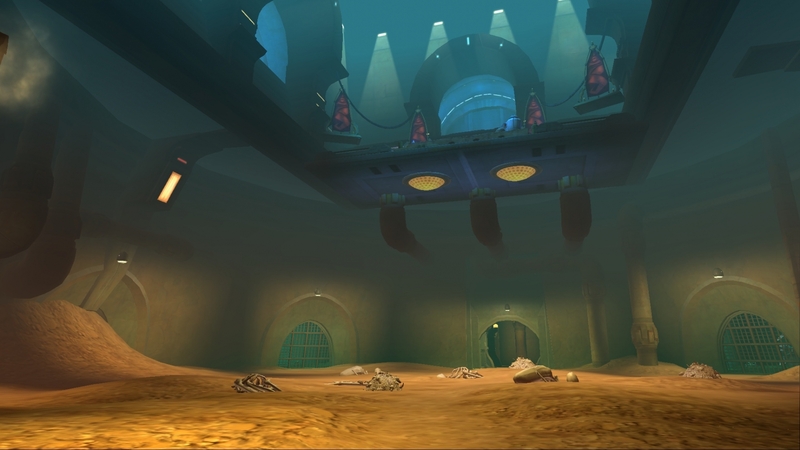 The Poison Pit is a little Cantina where you will start your adventures. Make sure you click on the Bind Point at the entrance. Try to log out here when you’re done playing, so when you come back, you’ll have an XP boost for a while. Head outside after collecting the available quests. 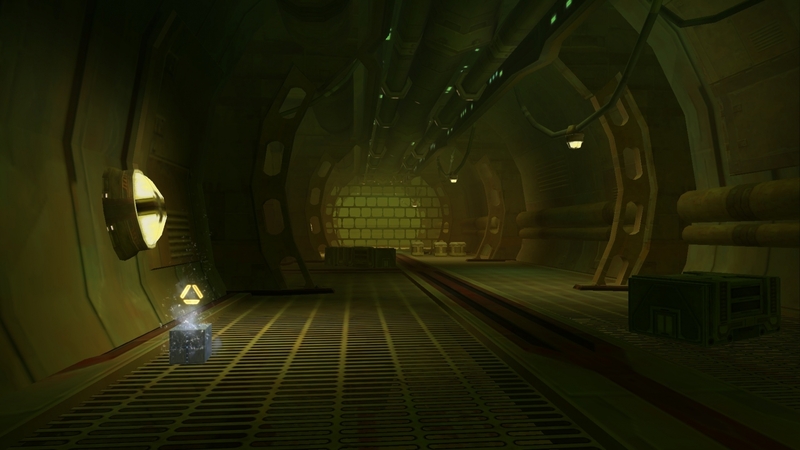 Keep in mind there may be few more quests you can collect here after you get a level or two, so keep checking back. 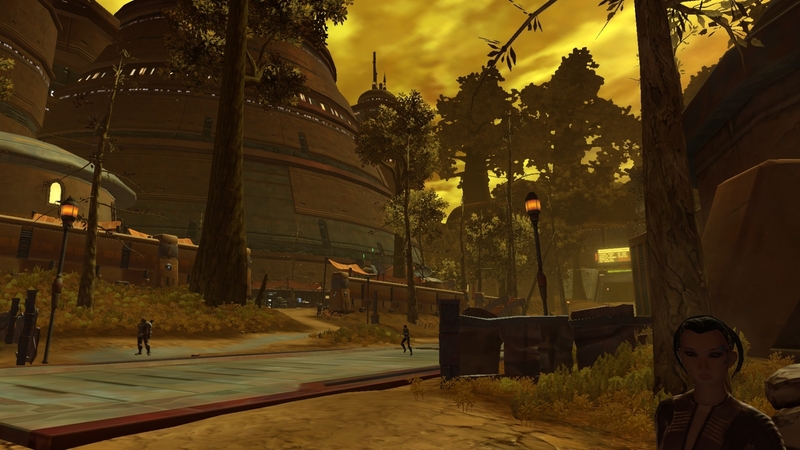 Jiguuna is a small town that has risen up around Nem’ro the Hutt’s palace. As you will quickly learn, there is fighting in the streets here. 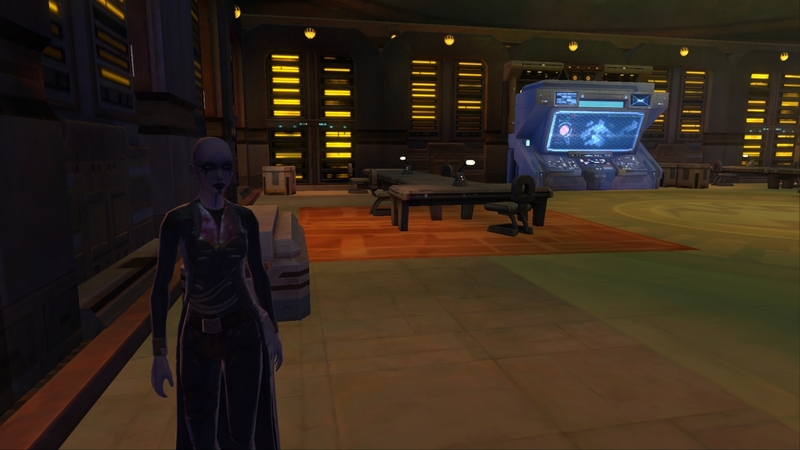 Be careful where you go and make sure you keep an eye on your friends and foes in the area. You should have a few quests right here to complete. Head back into the Poison Pit to turn them in. 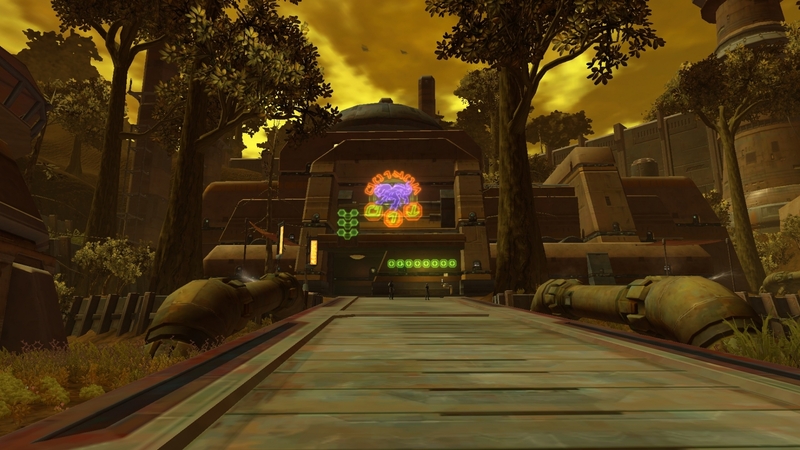 The next set of quests should take you south across town to Nem’ro‘s palace. You will find a handful of vendors in the Market. There is nothing PVP-related here because you cannot PVP until you are 10th level. By then you should be off planet or close to it. The class trainers are even out here in the corner so make sure to train up as well. 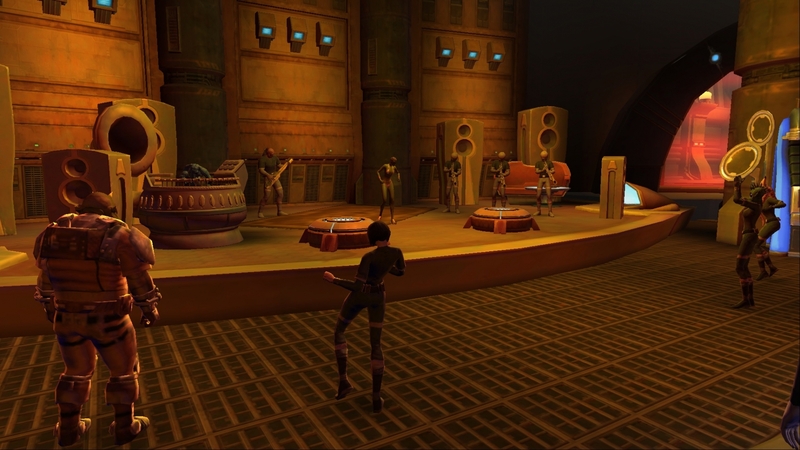 Once this is done head into Nem’ro’s Palace. 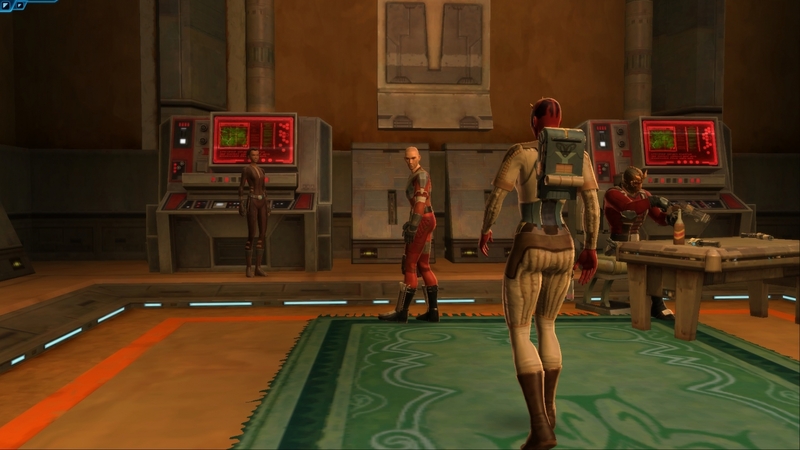 Get in the habit of binding at all bind points as well as unlocking Taxi Droids as soon as you get to a new place. 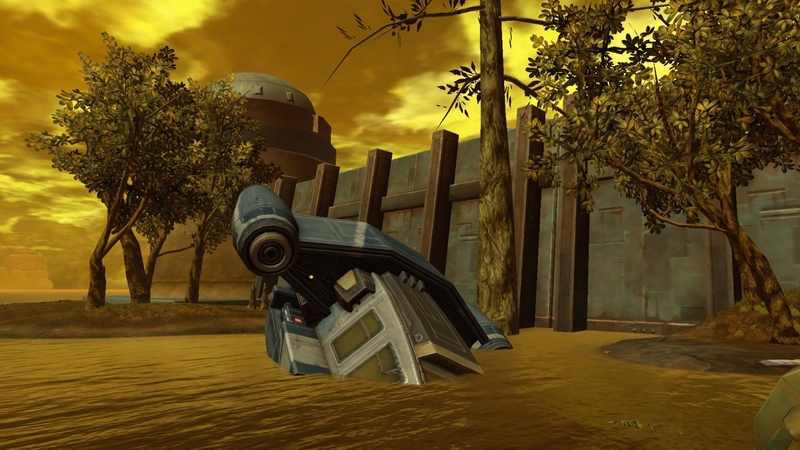 It is too easy to forget later and get stuck or have to run all the way back through an area you should be able to take a speeder through. 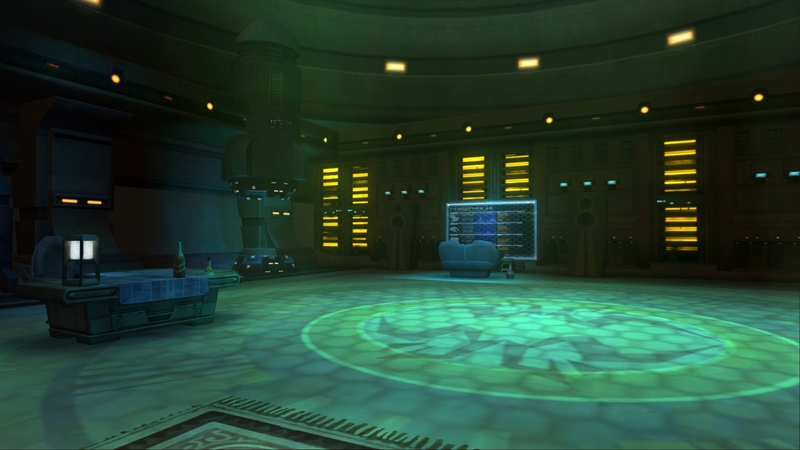 Once you have bound and spoken to the Taxi Droid head into Nem’ro’s Palace. 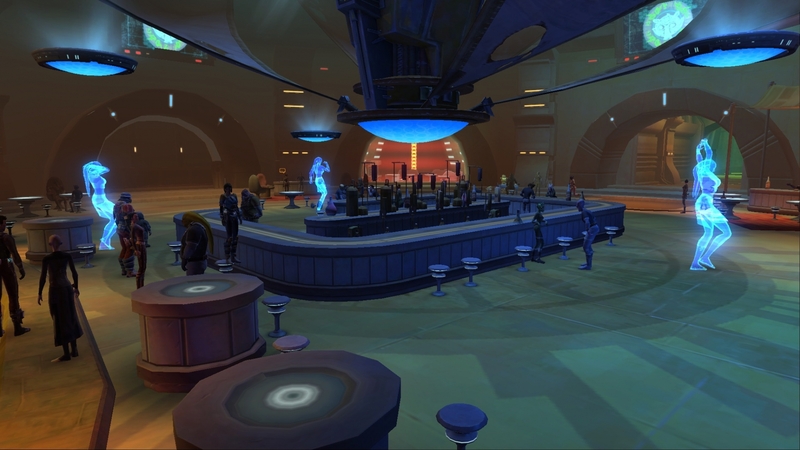 You will come into a very large and lively Cantina in the heart of Nem’ro’s palace. Keep an eye out as you will see many of these NPC’s give you quests at one time or another. There are a lot of quests to be had here, but they will be spoon fed to you as you level and progress through your class quests. You should have new quests that can be picked up every time you complete a section of your class quest. 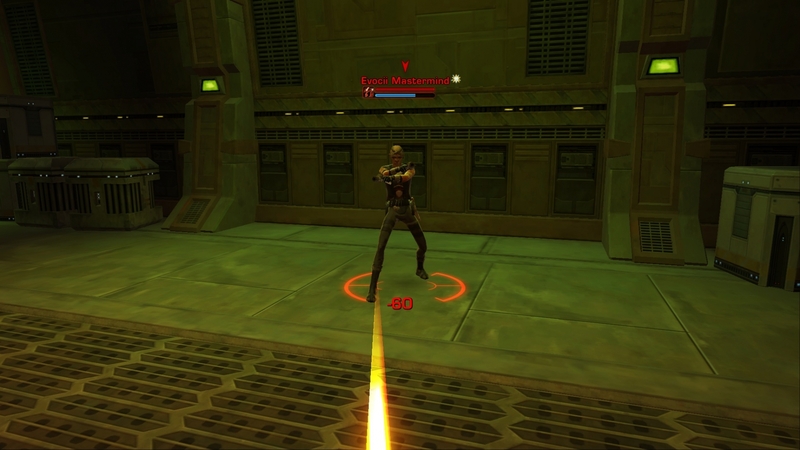 You can tell when this happens as you will get XP, loot, and credits. 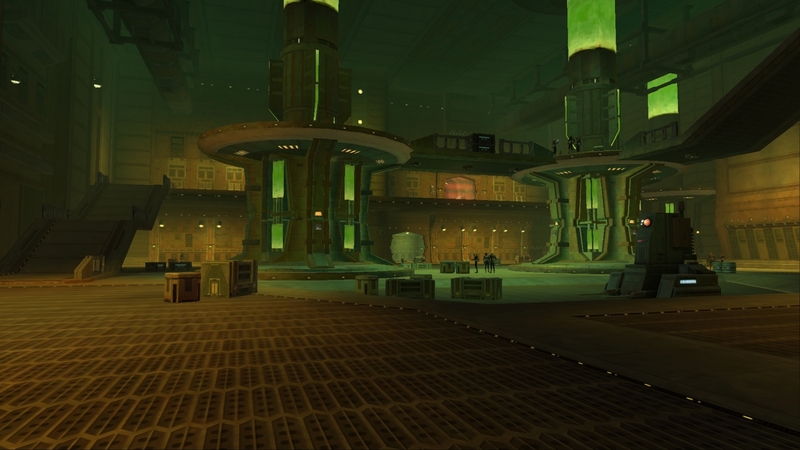 You will also be sent off to a new area of Hutta. There is a lot to see here in the palace, so take your time looking around. This is a fun place to explore. 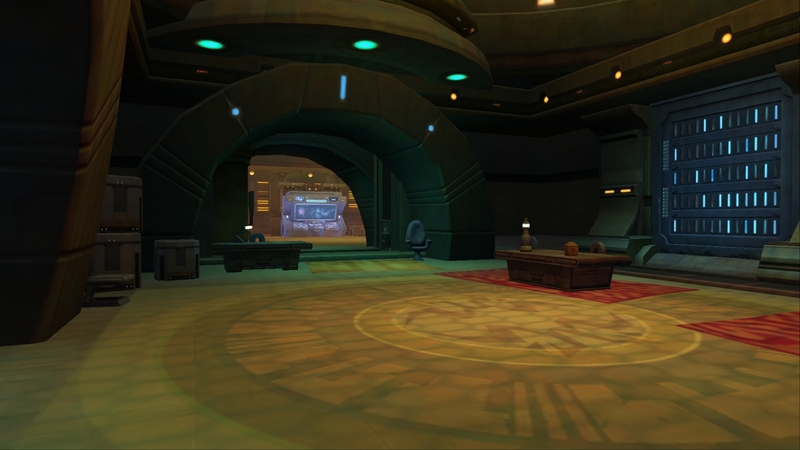 Do what business you need to accomplish in Nem’ro’s palace, and then head into the wilds. 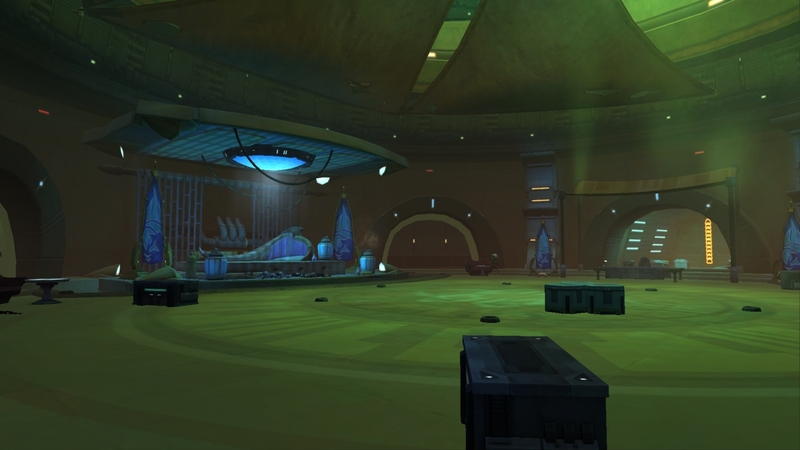 This is the first place you will go to out in the wilds to complete your quests. There are also a few quests you can pick up. There’s a vendor here and a bind point but there is no Taxi, which is a bit of a drag. You can also get the early Heroic quest here. I would advise saving it for a little later when you have quests to do in The Rust Yards. 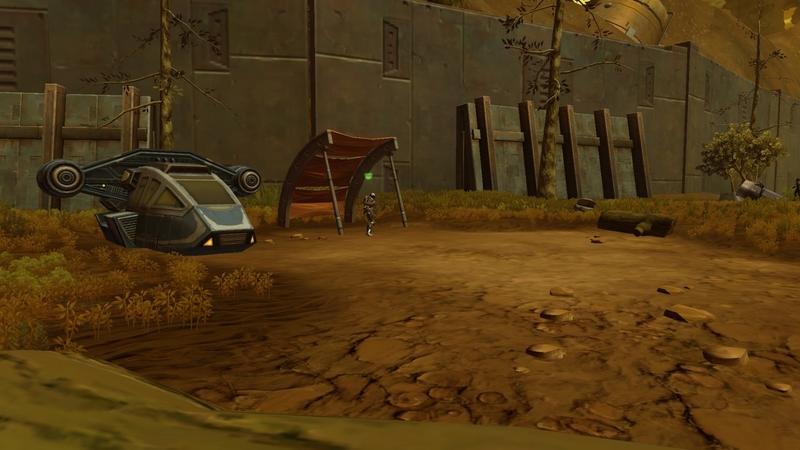 Just north of the camp is Grahuur, a wookie hunter. 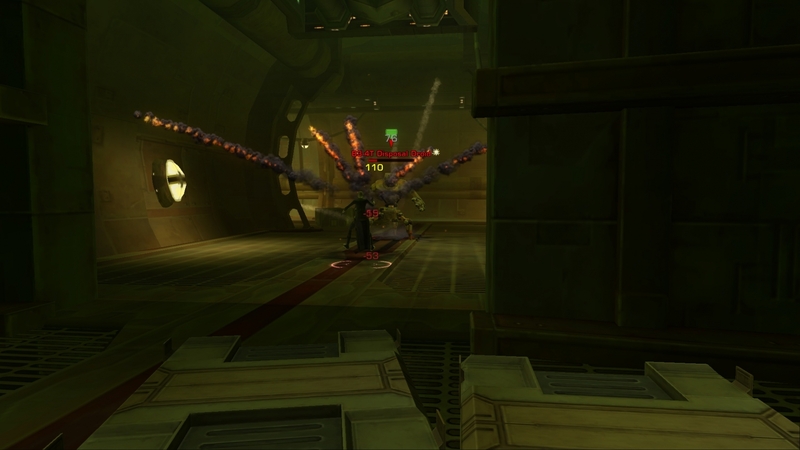 Take him down for some extra loot if you are feeling up to the challenge. As you move around the Evocii Work camp keep an eye out for lore totems to the east and north of the camp. Make sure to click on them to pick up a little extra XP. 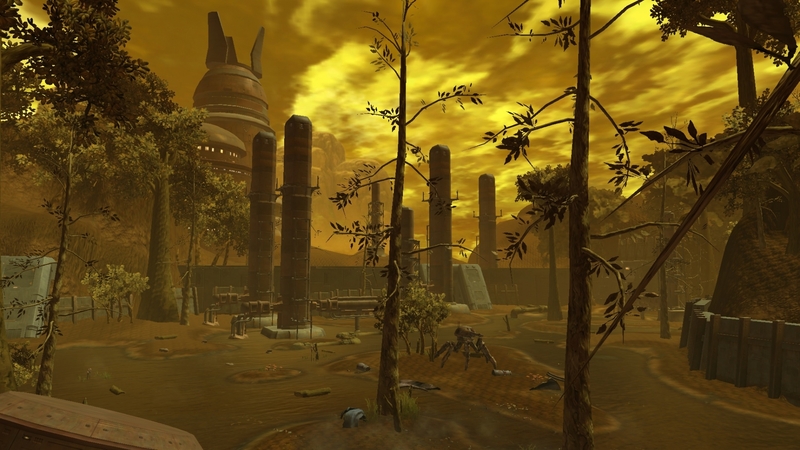 The Evocii are all over The Bog south of the Evocii Work Camp. You should have no trouble fulfilling quests here. 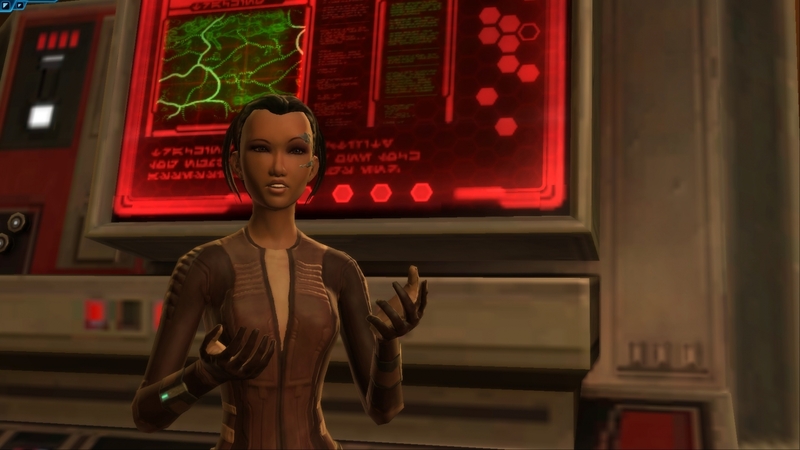 When you get to the heart of the resistance, look on the ground for a datapad. This will give you a quest. 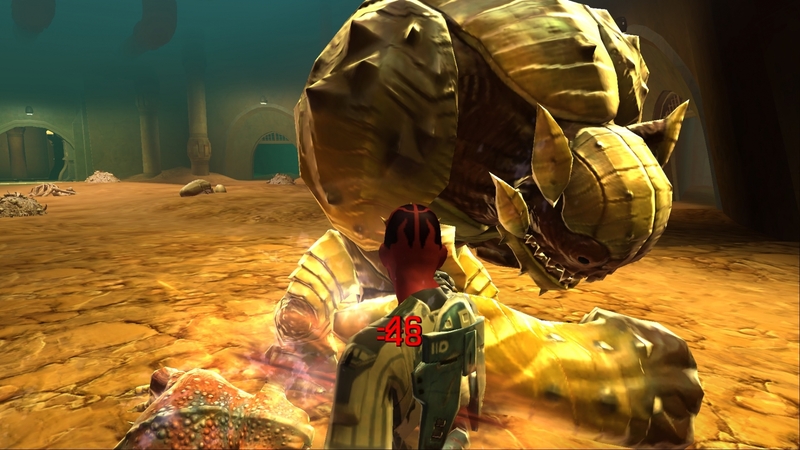 Be ready for a fight when you come out of the cut scenes, as it will be quite possible there will be many enemies around. Look for the small huts to the east. One contains some Evocii that will offer a quest as well. 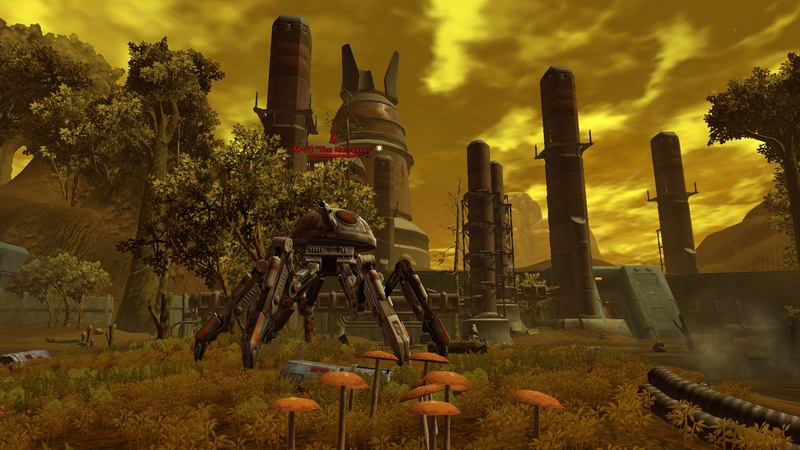 In the southern area of The Bog you will easily be able to spot a huge droid, M-78 “The Harvester”. It is a level 6 champion boss. If you get the chance, defeat him for a good chance at some nice random loot. His location is -222, 965. Once you have cleaned up your quests, you have one more thing you should do here. Look for a downed pipe on the hill. 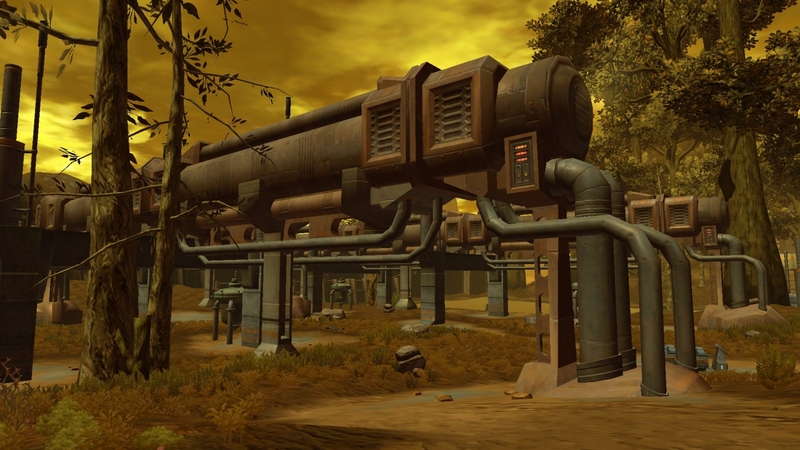 Run up the pipe and to the east for your first Datacron here, +2 AIM. 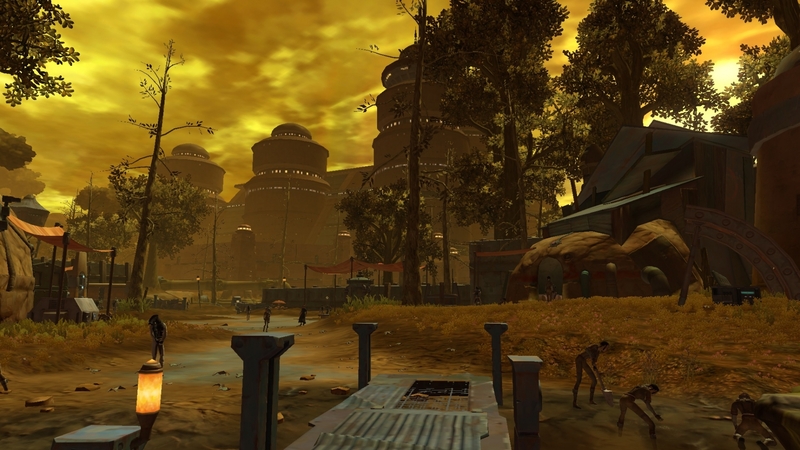 After that, head back to the Evocii Work Camp, Jiguuna, and finally Nem’ro’s palace for the next leg of quests in the Rust Yards. Before getting to the Rustyards, visit the small outpost on the road. 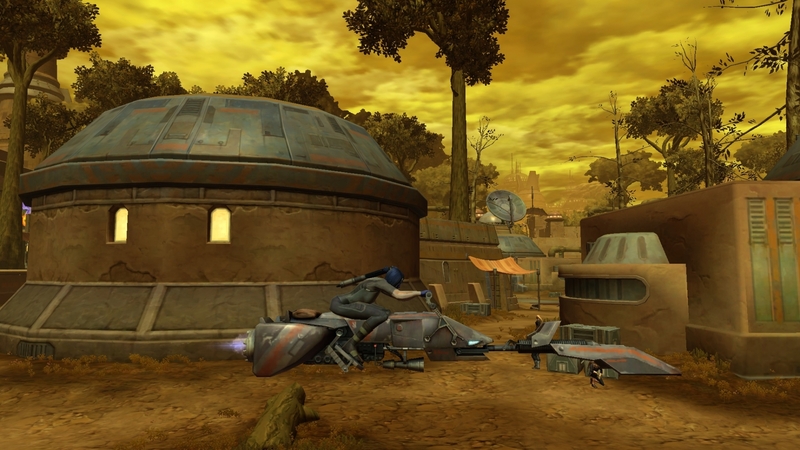 When you get to the outpost on the road to the Rustyards, set your bind point and talk to the Taxi Droid. Collect or complete any quests you might have. If you are ready to do some (+2 HEROIC) quests, now is the best time to give it a go. 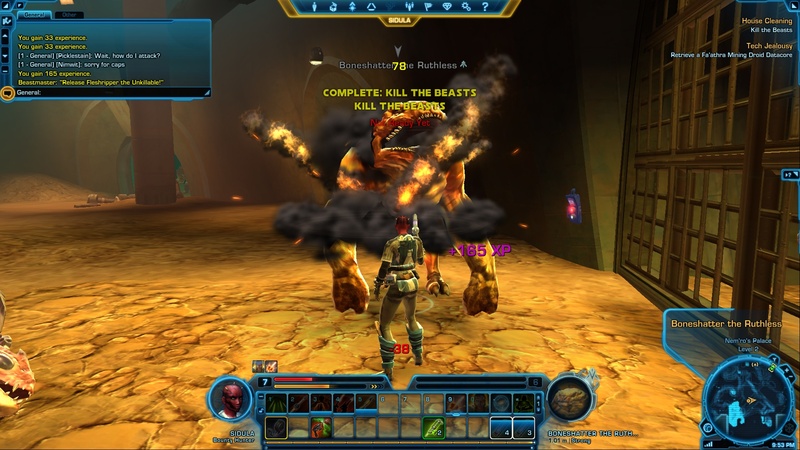 This means it is recommended that at least 2 characters of the quest’s level work together to complete the quest. 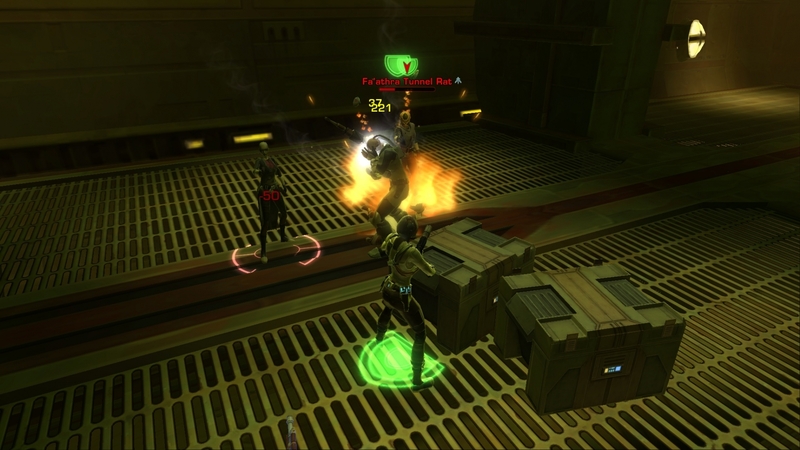 If you wish to give real group fighting and teaming up a go, now is a great time to start. If you are more of a soloer, you can save (+2 HEROIC) areas for the last thing you do on the planet before you leave. It’s up to you, but the chances of you getting some nice gear upgrades are good and it would be a shame to wait for them. Some can be as good as or better than your class gear that you receive. Take your group due west to the entrance to the Sewer Maintenance Tunnels. 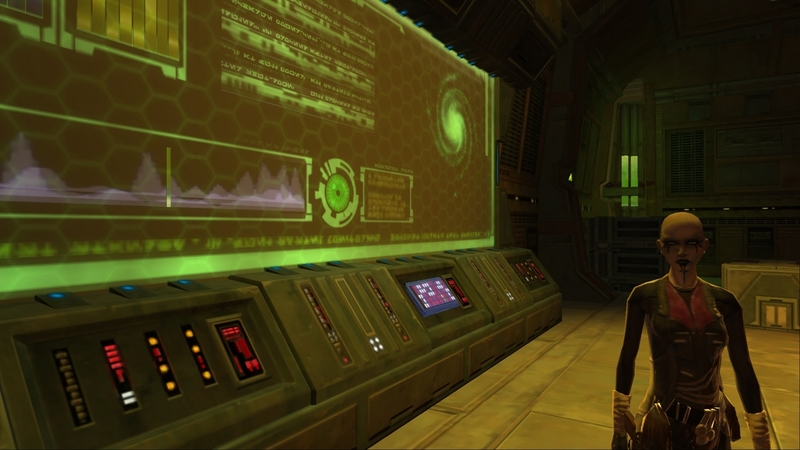 Work your way down, clearing and completing objectives along the way. 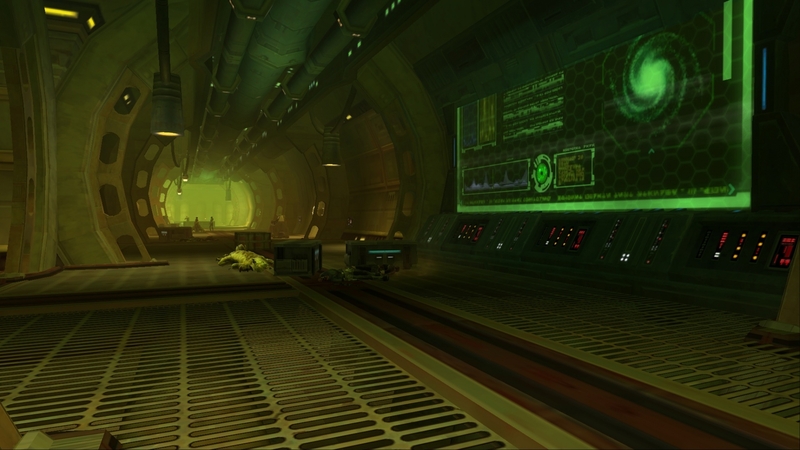 Explore all sections of the tunnels. 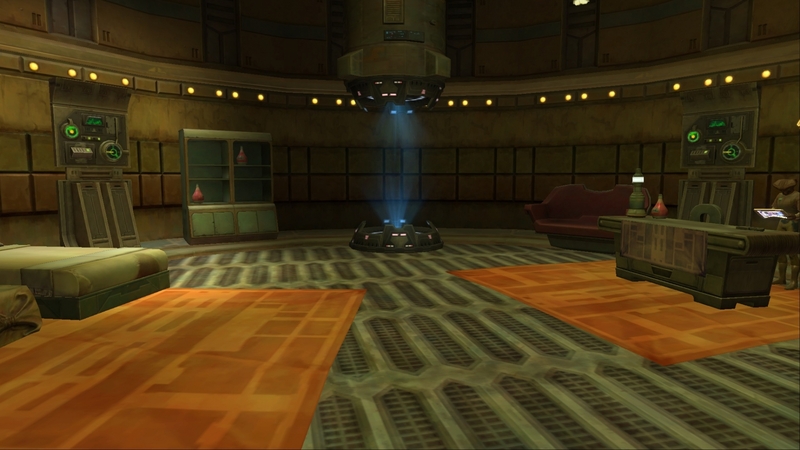 You will come across a named champion boss mob, B3-4T Disposal Droid. 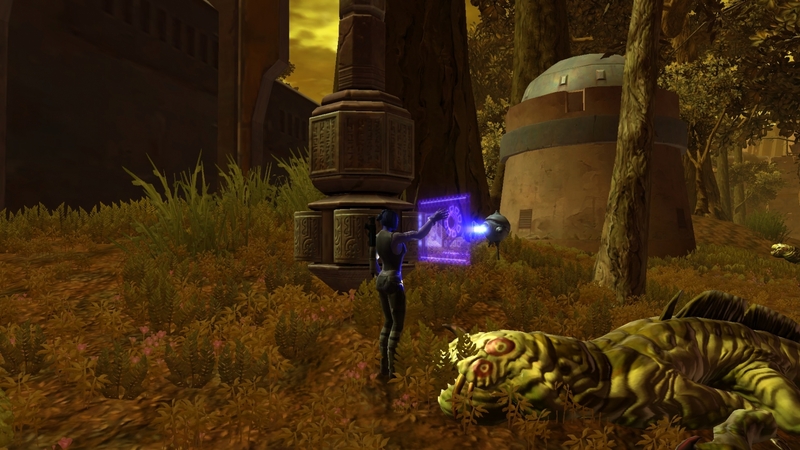 It is right in front of the second Datacron, the Blue Matrix Shard. Be wary as this boss is pretty nasty but you should be able to handle it. Continue to follow the Sewer Maintenance Tunnels to the end. This pops you out right inside The Rustyards to the second half of this quest. Finish this quest, then head north to the shoreline. Follow the shoreline east to an oil pipeline that is heading across the water to some islands off the coast. Jump up on top of the rigging and make your way out. Be careful not to fall or you will have to start over. Be very careful where it turns. It is very easy to fall off here. Walk to the end and drop down off of it. 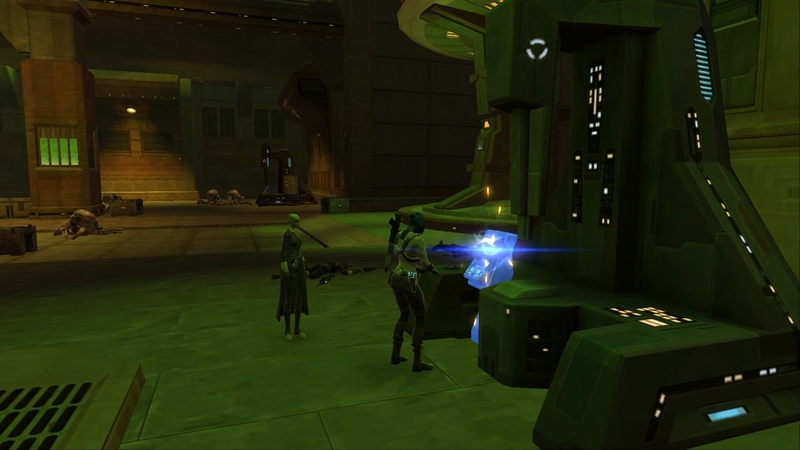 Now you can use the +2 Presence datacron. 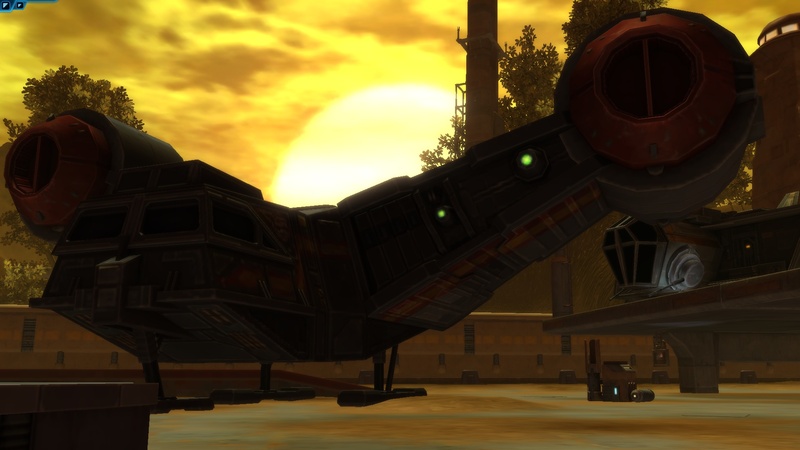 When everyone has used it, head south east and take out Bounty Hunter D’nar. Hopefully he will have some nice loot for you. He is a 7th level elite boss MoB. If you have a good group, now is a good time to swing around the south of the Rustyards and head north west to the Old Muckworks. 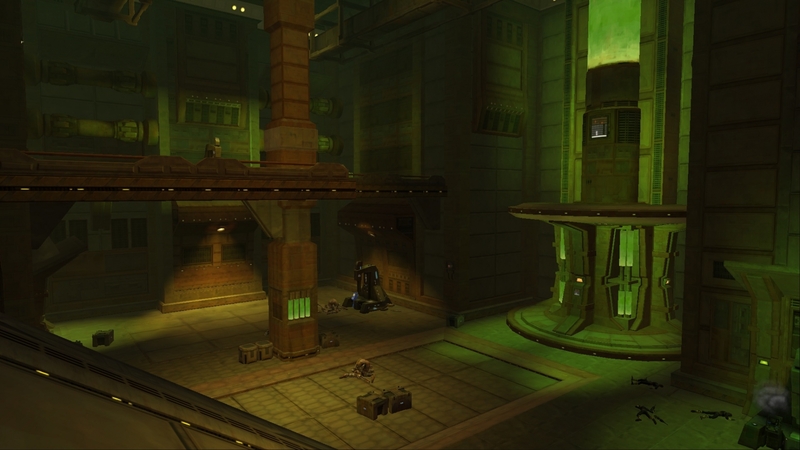 This whole area is a heroic area and there are a few quests your group can complete here. See the Old Muckworks section for more details. After you’ve completed the outside quests, go into the Rustyards and clean up, and work on the quest you have to complete inside. 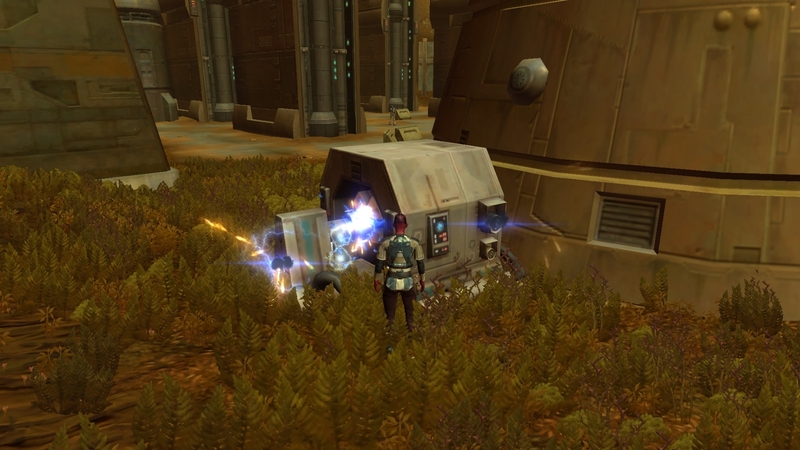 As a quick note, there are droids that lumber towards you and explode when they get close. They don’t shoot at you or anything else. 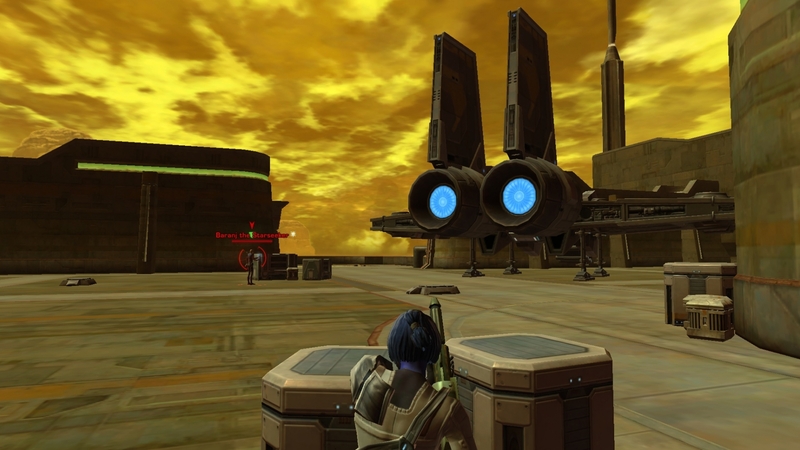 Run away from these Fa’athra Blasting Droids and blast them before they blast you. 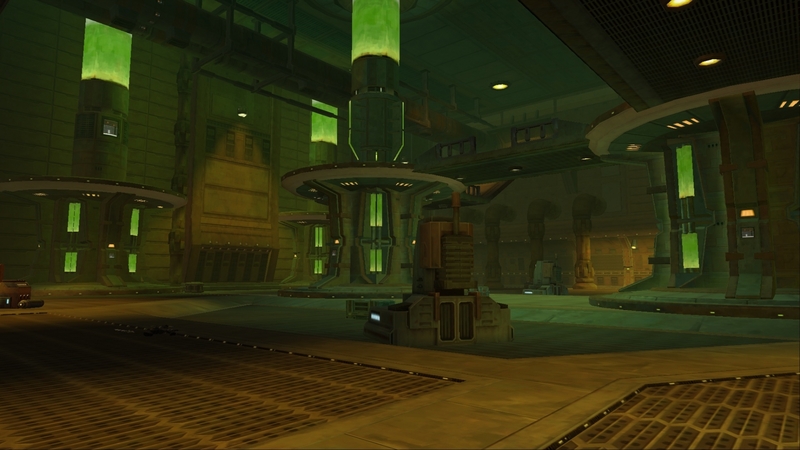 Inside the gas mining facility, you might want to head down to the basement first, if you have the mission Keeping Secrets. 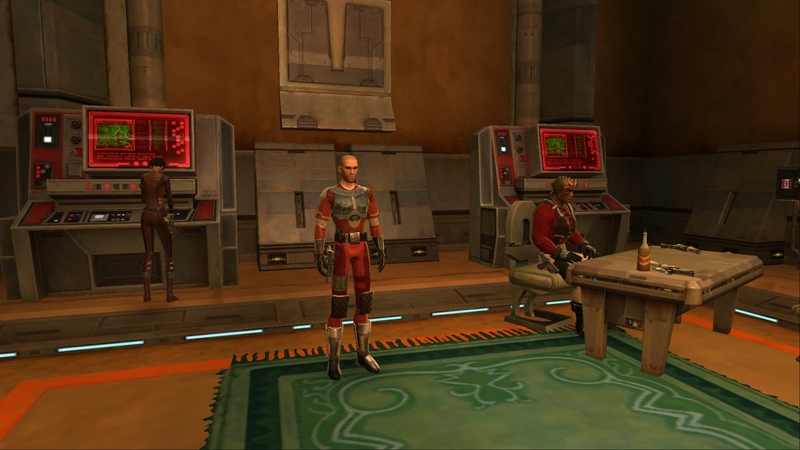 Depending on how you play it, you may need to complete that quest at the same time as doing some of the others here. It’ll save time so you don’t have to wander around the same area multiple times. The River Lands is west of the Rustyards and east of the Old Muckworks. There are a few quests that can be done here. Look in the river on the east side. 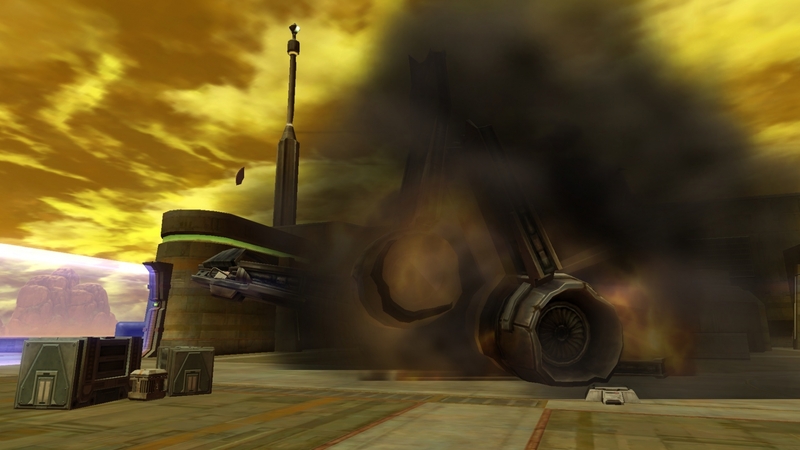 There should be a quest related to that crashed spaceship. To the north of The River Lands, there is a small island covered with Chemilizards. On the north western side of this island there is a big old nasty one called The Putrid Chemilizard. It is a level 7 champion boss. This nasty one can drop some nice random items if you can just get it dead. Good luck! Warning to explorers: this entire area is a (Heroic 2+) area and should not be traveled lightly! You have been warned! There are a couple of good (HEROIC 2+) quests out here and even one that has a couple different parts. This area offers a great place to learn the basics of grouping and working together. 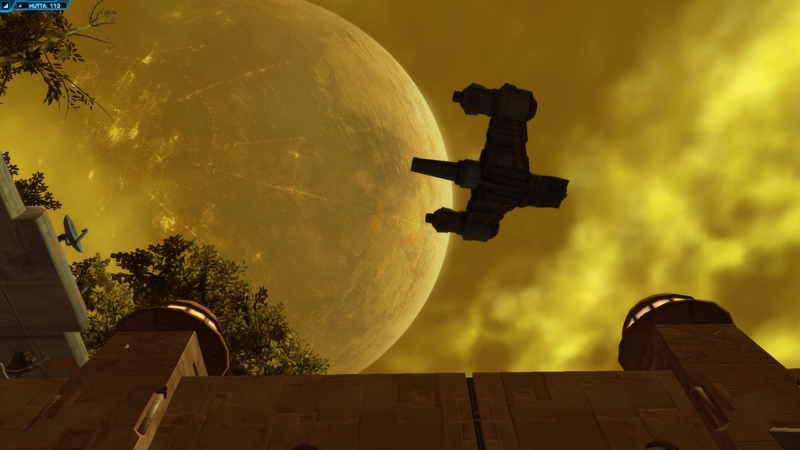 I think this area is probably the best (HEROIC) of the first four planets that you will start on. Don’t miss the chance to enjoy it. Make sure everyone in the group has the quests. If they don’t, you can share them from your quest log (L) so everyone can get credit for them. Some very nice end rewards are offered for these areas and it would be a shame to miss out on them. 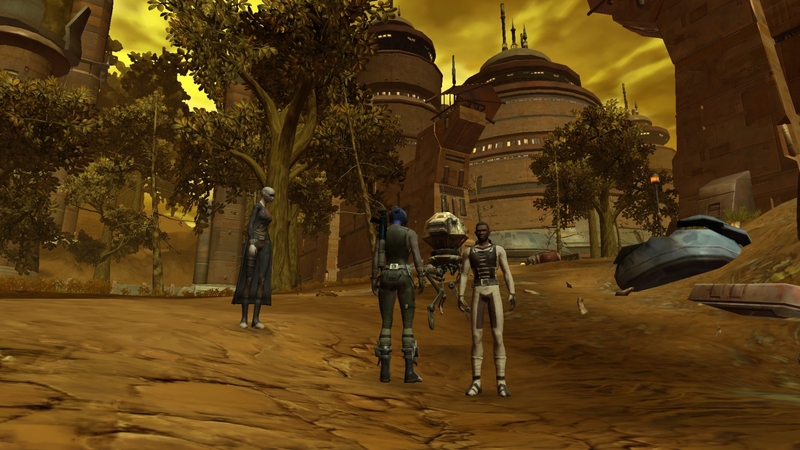 Now that you have rocked the Old Muckworks and gotten some killer gear, it’s time to head back to Jiguuna and train up! Make sure to sell, repair and grab whatever quests are left. 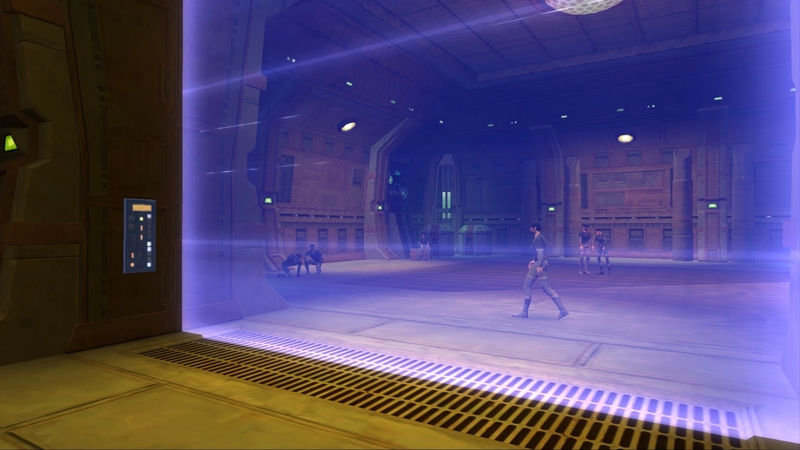 It’s time to head to the final area in Hutta, Fa’athra’s palace. Time to take the fight to him! 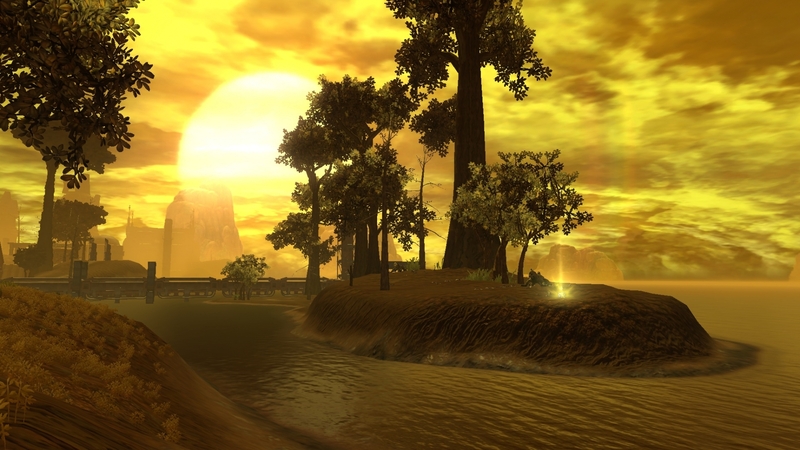 Fa’athra has attracted a good amount of followers and they have built a small town of their own around Fa’athra’s palace. The place is swarming with his supporters, so keep a close eye out as you make your way up. There are a few supporters who wander around so keep an eye on them as you make your way through the town to the palace. 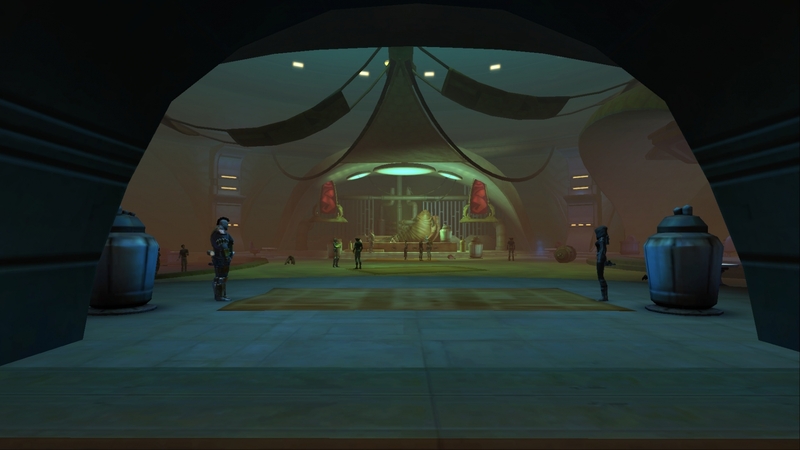 Once you get up into Fa’athra’s palace, make sure to click on the small lore sign at the entrance. 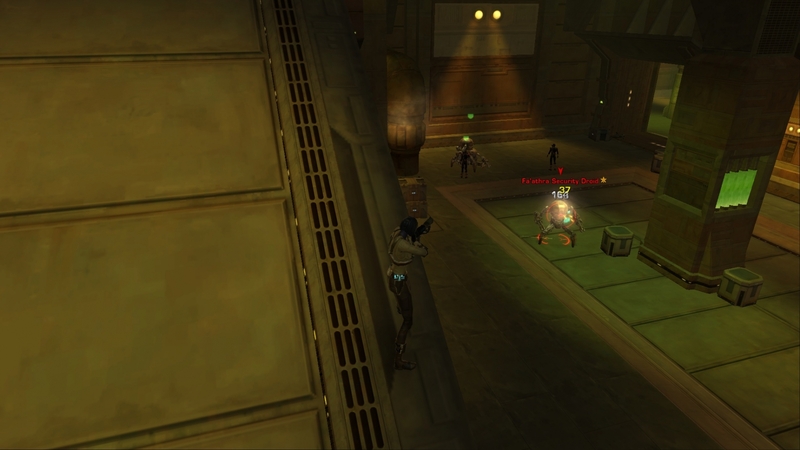 As you make your way up into Fa’athra’s palace, check up on the walls for security cameras. Click on them for a bonus quest to disable his security. 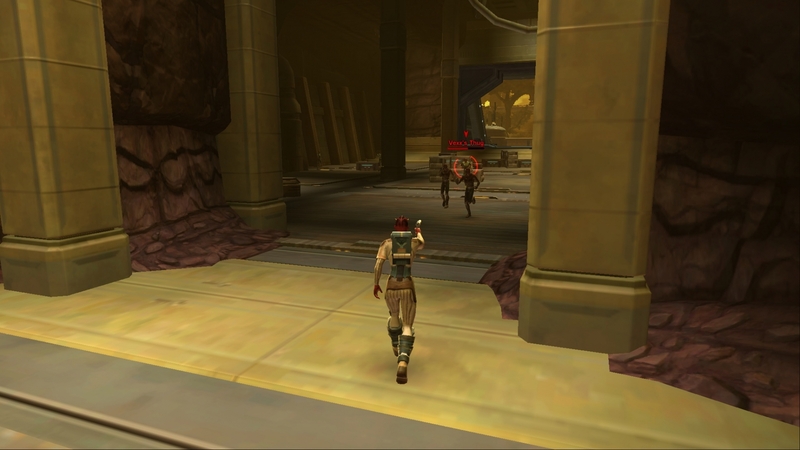 Make your way through Fa’athra’s palace, clearing each level as you go. 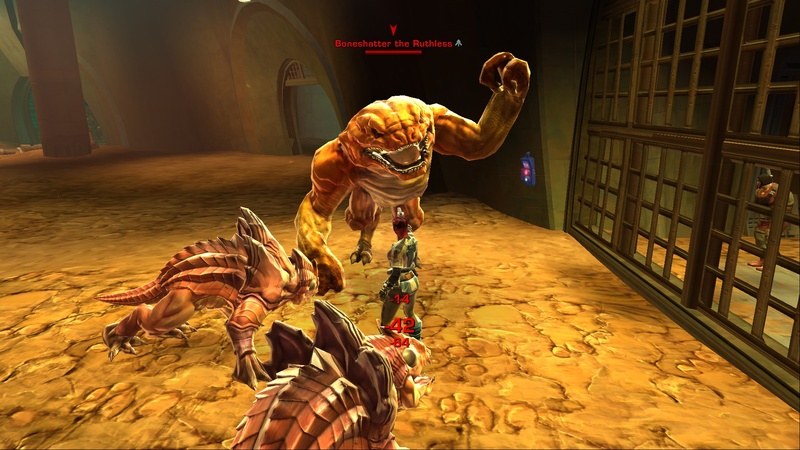 Once your quests are done, move down to the next level until you finish up in the beast pits collecting rancor eggs. 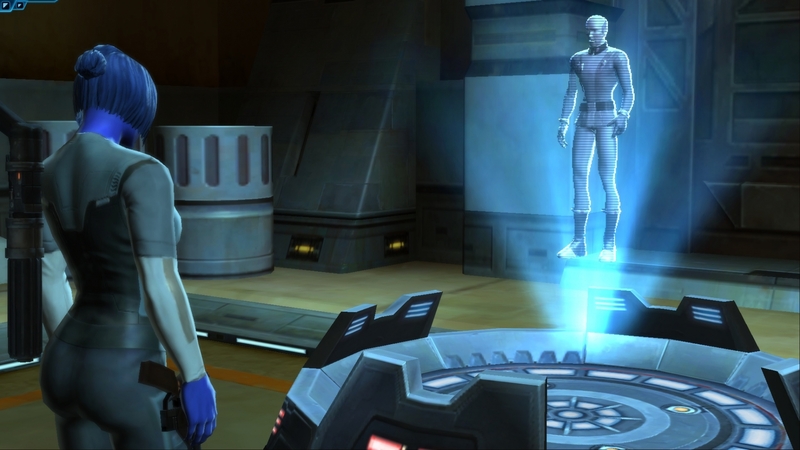 When you are in the room with the carbonite, make sure to click the one that is the lore object as well as the one for the quest. 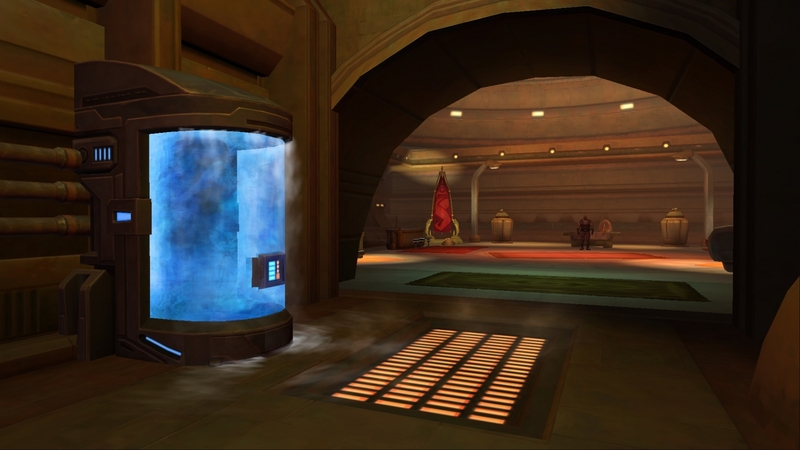 In the room next to the prisoners encased in carbonite there is an elite Fa’athra boss. You might want to drop him while you are there to see what he might have for nice items. 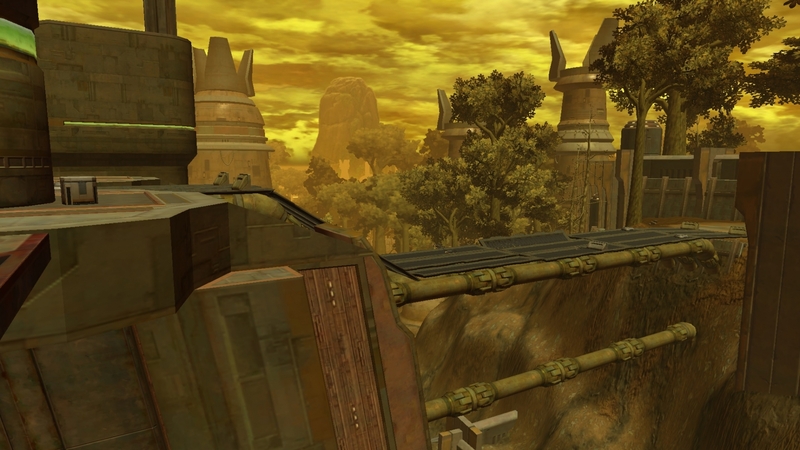 Once you are done with all your quests here, use your Fast Travel ability to travel to the small outpost just outside of Fa’athra’s territory. 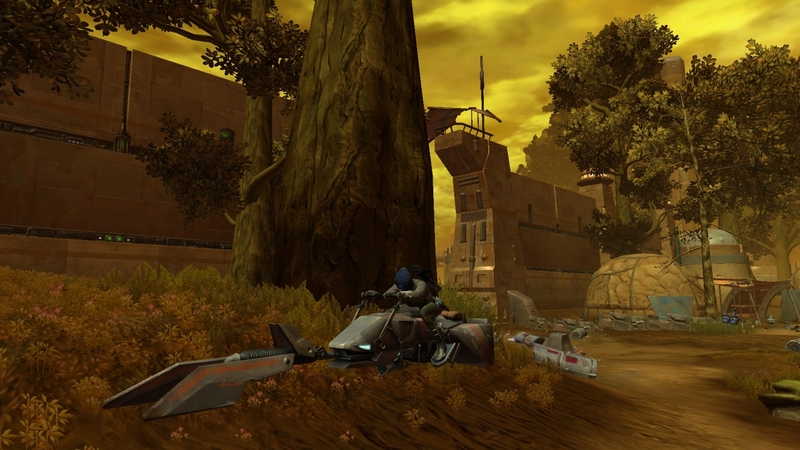 Turn in your quests and then take a speeder back to Nem’ro’s palace. 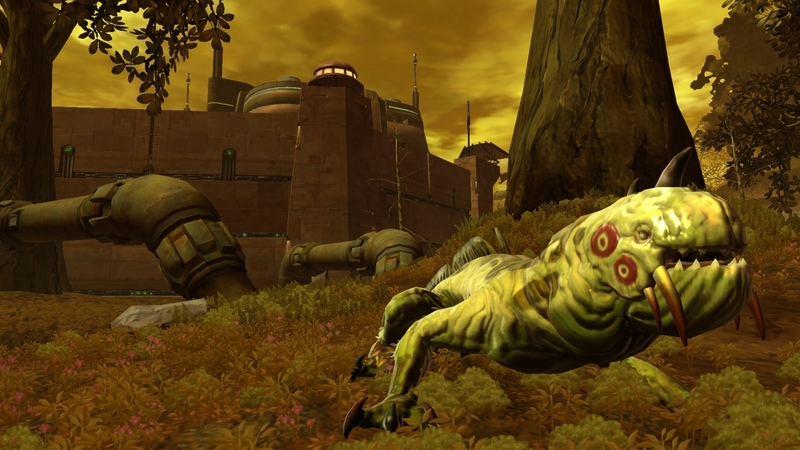 Finish up your class quests and say goodbye to Hutta. 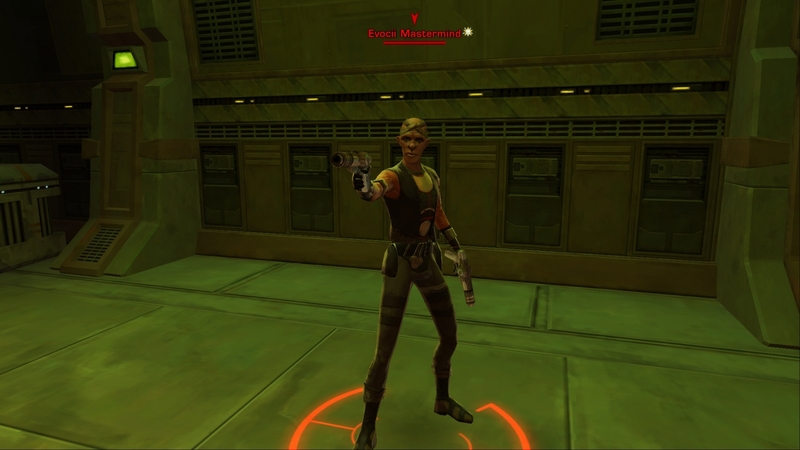 Dromund Kaas, here you come! 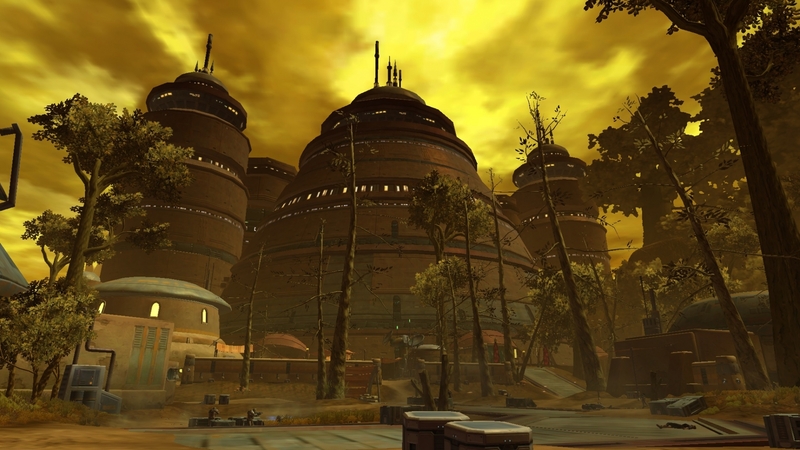 That’s about all there is to the new player planet of Hutta for Imperial Agents and Bounty Hunters. This is my favorite starting area of them all. 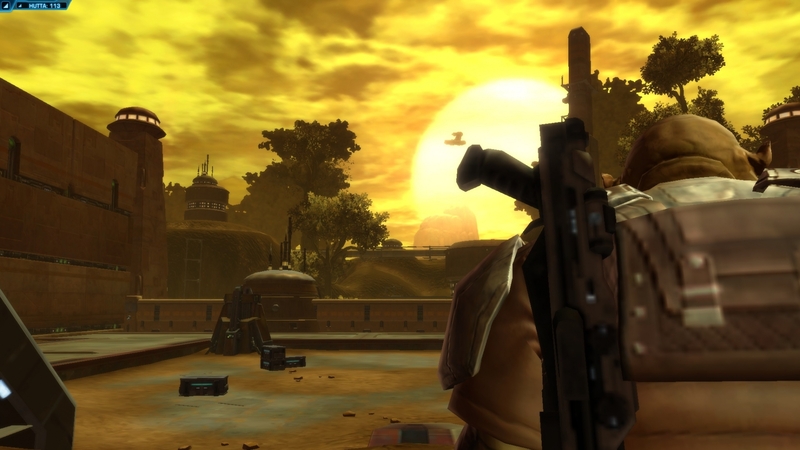 With the Hutt theme, it pulls you right into the world of Star Wars. 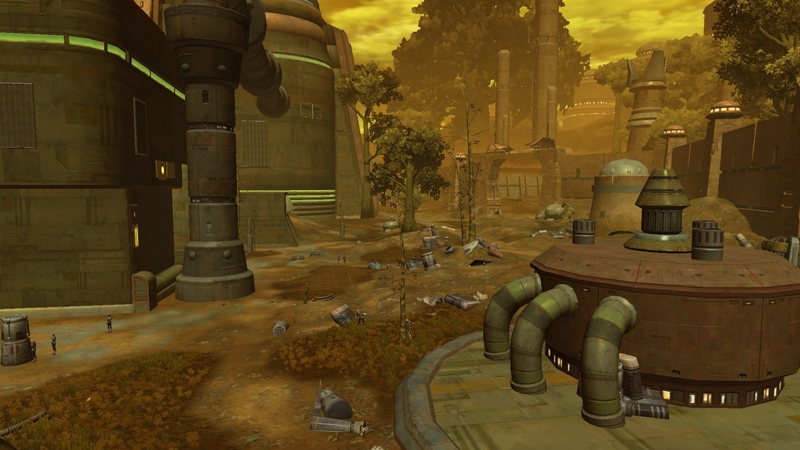 The heavy droid influence helps and the strange alien indigenous species all come together for a great starting area. If you end up on Hutta, take your time exploring it. 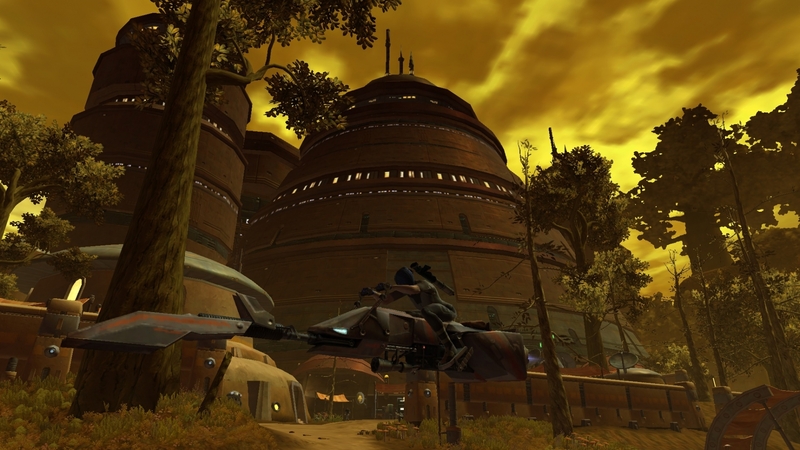 If you weren’t planning on it, you might just want to build an Imperial so you can enjoy this great starting area. 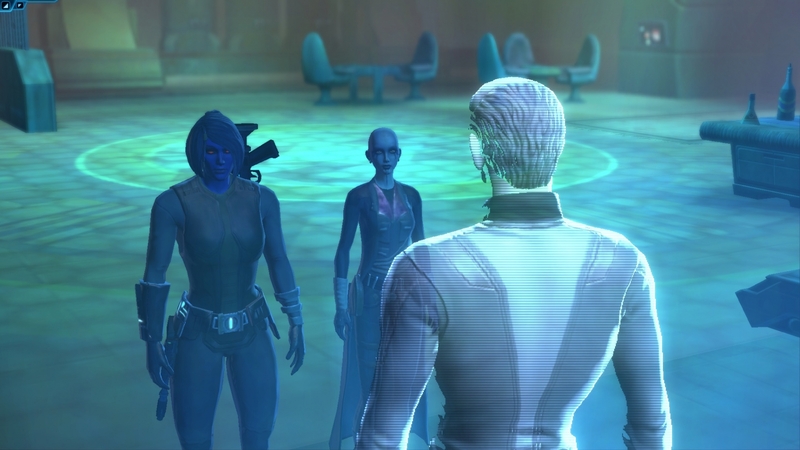 See you soon on Dromund Kaas!